Traffic moves along Route 21 in downtown Newark, N.J., where a gas station lists the price for regular unleaded gasoline at $1.72. Al Mak is the manager of Pronto Food Mart in Austin, Texas. Independent gas stations like Pronto are often the first to offer cheaper gas when the price of crude oil drops. 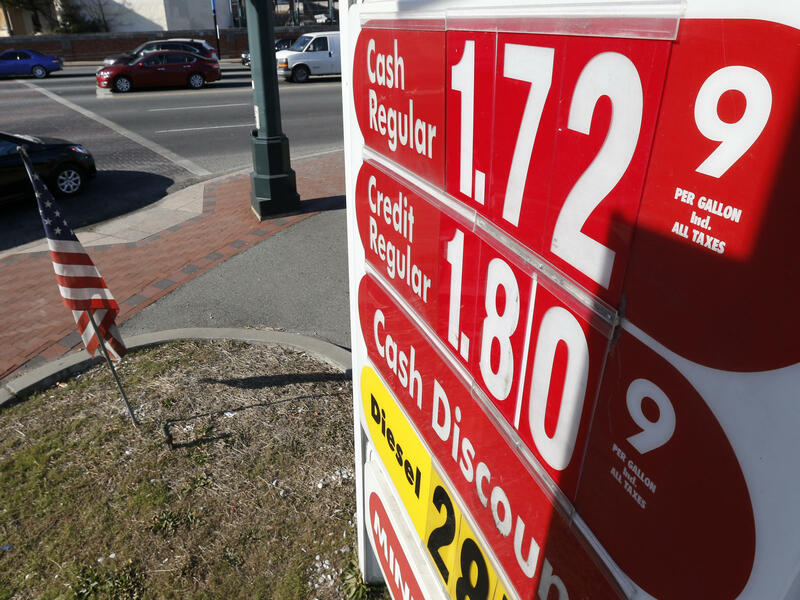 By now, the surprise of cheap gas has probably worn off. But drivers on the hunt for the very best prices have noticed a new trend: Small, independent gas stations are often the first to cut prices when the price of crude oil falls. This has a lot to do with how gas is bought, sold and moved from pipeline to pump. "It's definitely savings," says Doug Warden as he fills up at Pronto Food Mart, a tiny, neighborhood gas station in Austin, Texas. "It's like I got a bonus." Pronto Food Mart was one of the first stores in the area to slash prices after the cost of crude oil dropped. "Because no one was going down," says Al Mak, the manager at Pronto. "The gas was coming at a lower cost, but people sustained the higher prices." 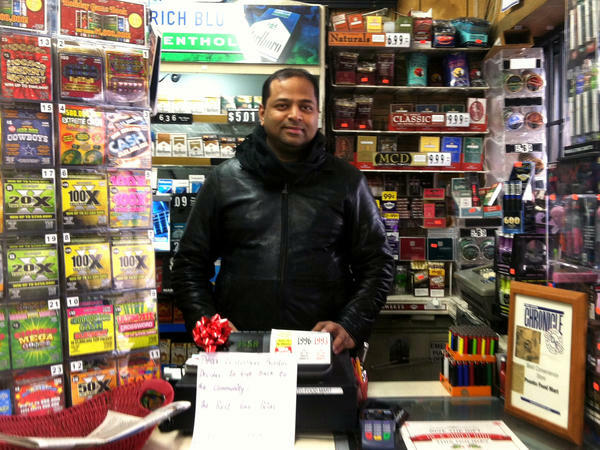 Mak says his gas prices keep people coming back to buy other stuff, including "different teas, lots of energy drinks, lots of wine and beer selection." It's smart business, but how can Mak afford it? Across the country, shops like Pronto Food Mart undercut competitors by buying what's called unbranded gasoline. There's no big oil company sign at Pronto Food Mart. When Mak sees a station with a Shell or Chevron sign, he thinks one thing: "Under contract my friend! For 15, 20 years. Can't offer best price like we do!" Here's how it works: Pronto gets its gas from a fuel distributor, known as a "jobber." The jobber's trucks pick up gas from distribution hubs linked to refineries by a pipeline. When a gas station is in a branded contract, it needs to buy that brand of gas. When it's unbranded, it basically buys it on the spot market, taking advantage of that day's lowest prices. "Obviously, if we're delivering to a Shell store, we'll go pick up the Shell gasoline," says Clay Johnson, president of Tex Con Oil, a fuel distributor in Austin. "If it's a Texaco store, we'll pick up Texaco gasoline." In recent years, big oil companies have been leaving the retail gas game and selling stations to focus on drilling and production — where they can make more money. That keeps jobbers like Johnson busy as more stations have the choice to contract with a brand name or go generic. "If it's not a branded convenience store, typically they don't really care what brand it comes from," Johnson says. "And you do get different pricing from each major oil company every day." Johnson doesn't like generic gasoline. He says he's a "believer" in the benefits of the extra additives brands put in their gas, though many experts say they don't make much of a difference. There's also a business argument for contracting with a big name oil company. "When you have a branded relationship, you're basically having a contracted relationship with that supplier, and they protect that product before product that's not under a contract," Johnson says. "So that supply agreement comes in handy when product gets tight." Of course, if supply gets tight and prices jump, there's a solution for that at the neighborhood gas station. It will cost station managers like Mak more, so drivers will pay extra. Warden says he doesn't expect Pronto's gas prices to stay low for long. "No," he says with a laugh. "They'll figure it out. They'll want their money back. I'll pay it." But, he says, he'll enjoy the low prices while he can. For the first time in months, the price of gas has actually crept up. Mind you, it's still lower than it's been in years - around $2.06 a gallon. But that's not enough for some drivers who make it their business to find the cheapest pumps, and they've noticed a trend. Small, independent gas stations often have the best prices. As Mose Buchele reports from member station KUT in Austin, Tex., that has a lot to do with how gas is bought, sold and carried from pipeline to pump. BUCHELE: I guess that's the sound of savings. DOUG WARDEN: It's definitely savings (laughter). It's like I got a bonus. AL MAK: How are you today? BUCHELE: I'm doing all right. How are you doing? BUCHELE: The guy behind the counter insists they were the very first. MAK: Because no one was going down. The gas was coming at a lower cost, but people sustained the higher prices. BUCHELE: Store manager Al Mak says their gas prices keep people coming back to buy other stuff. MAK: Different teas, lots of energy drinks, lots of wine and beer selection. BUCHELE: It's smart business, but how can they afford it? Across the country, shops like this undercut competitors by buying what's called unbranded gasoline. There's no big oil company sign at Pronto Food Mart. When Mak sees a station with a Shell or Chevron sign, he thinks one thing. MAK: Under contract, my friend, for 15, 20 years - can't offer best price like we do. BUCHELE: Here's how it works - Pronto gets its gas from a fuel distributor known as a jobber. Their trucks pick up gas from a distribution hubs linked to refineries by pipeline. When a gas station is in a branded contract, it needs to buy that brand of gas. When it's unbranded, it basically buys it on the spot market, taking advantage of that day's lowest prices. And so here I am, one more step up the distribution chain. I'm at Tex Con Oil in Southeast Austin. I'm standing next to a big tanker truck. Every morning, trucks like this one deliver fuel all over the region. CLAY JOHNSON: Obviously, if we're delivering to a Shell store, we'll go pick up the Shell gasoline. If it's a Texaco store, we'll pick up Texaco gasoline. BUCHELE: Clay Johnson is president of Tex Con. And so are you - you're a jobber? JOHNSON: I'm a jobber, yeah, a fuel distributor. Jobber is an old-school name for just a fuel distributorship. BUCHELE: In recent years, big oil companies have been getting out of the retail gas game, selling stations to focus on drilling and production, where they can make more money. That keeps jobbers like Johnson busy as more stations have a choice - contract with a brand name or go generic. JOHNSON: If it's not a branded convenience store, typically they don't really care what brand it comes from. And you do get different pricing from each major oil company every day. BUCHELE: Johnson doesn't like generic. He calls himself a believer in the benefits of the extra additives brands put in their gas, though many experts say they don't make much of a difference. There's also a business argument for contracting with a big name oil company. JOHNSON: When you have a branded relationship, you're basically having a contracted relationship with that supplier. And they protect that product before product that's not under a contract, so that supply agreement comes in handy when product gets tight. BUCHELE: Well, there's a solution for that back at the neighborhood gas station. MAK: Pronto Food Mart, how can you forget (laughter)? BUCHELE: It will cost station managers like Al Mak more, so drivers like Doug Warden have to pay extra. You probably forgot about Doug, the guy gassing up his car at the start of this story. Do you expect it'll stay this way? WARDEN: No (laughter). Nope, they'll figure it out. They'll want their money back. I'll pay it (laughter). BUCHELE: But, he says, he'll enjoy it while he can. For NPR News, I'm Mose Buchele in Austin. Transcript provided by NPR, Copyright NPR.